I’d never thought I’d publish a ramen recipe in may. ‘Cause may is hot weather, and who wants broth stuff? Right? Theoretically yes, but since this may is weather-crazy, and one day is hot one day is WinterIsComing, I’m posting the recipe anyway. Then maybe you’ll use this in october. Now I’ll write a sentence I usually hate: ramen reminds me of italianpasta. But before I feel any more yucky because of this sentence, let me explain. 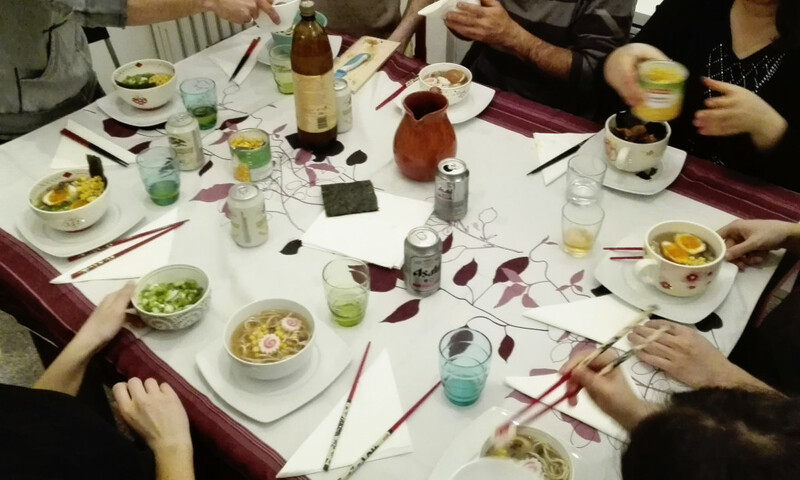 I’m not saying that because it has “spaghetti”, but because of these reasons: there are many types of noodles (mostly soba and udon), there are maaaaaany many regional differences, there are many broths and stocks you can use, and most of all there are loads of “toppings” you can add. 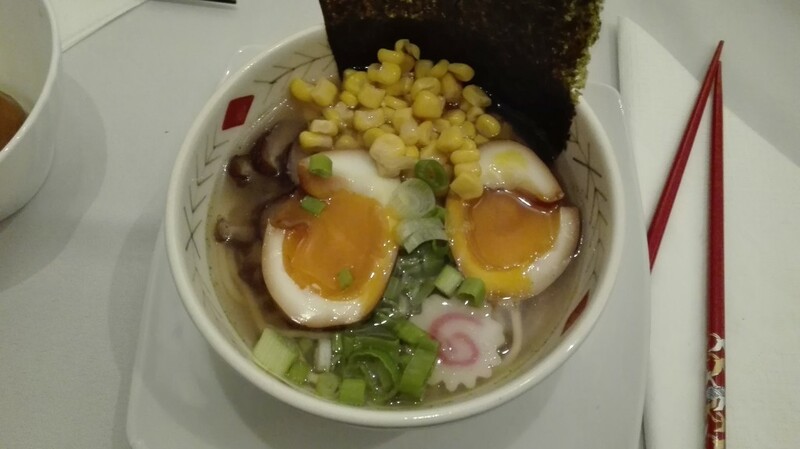 Ramen from manga or anime has a dark broth, light noodles, a couple of slices of pork roast an egg and a “cute swirly thing” (aka naruto, some sort of surimi fish cakes, to let you understand). But I can tell you that, having gone through different recipes and having made it quite some times in the two years passed from our honeymoon, there is another reason: leftovers. The first ramen I’ve made was made religiously following the recipe. I’ve started a day ahead. To make dashi (the broth base), eggs, roast. Bouillon cube? Done (japanese people use it, so don’t freak out). Chicken leftovers instead of pork roast? Done. Sweet corn from a can? Also. Basically, the theory behind everything is this: you need noodles, broth and toppings (if you have any… think of instant ramen… it doesn’t come with roast and eggs!!!). This means it’s incredibly customizable, also to face intolerances, allergies or veg regimens! Moreover it means I have no quantities nor an actual recipe, but just random ideas (well, one thing I can say: we use around 125g of noodles, for two servings, and half a litre of water to make broth). Broth – chiken, miso, dashi, vegetable, fish, tonkotsu (pork bones cured and boiled for around twelve hours, sooooooooooo good *_*), TIP: add some water from the mushrooms or the kombu, and for an extra “japanese kick” start your broth from a sautee of minced garlic and ginger in sesame oil. Make broth in one pot, noodles in another (without salt!). Drain noodles “al dente”, rinse them under running cold water (to eliminate the starchy goo-y-ness). Put them in a bowl, add your toppings, add two or three ladles of broth. Eat with your chopsticks slurping all the way (both to cool it down and to properly taste all the flavours). And a spoon, it’s always handy in the end.